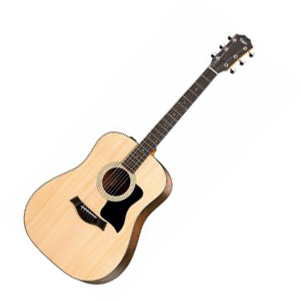 The Taylor 110e is a guitar which earned a spot in our best acoustic guitars list. It is more of an entry-level guitar which produces premium high-quality sound without spending a lot of money. While some people may find it more of a beginner choice, this guitar classifies as an excellent option for both, beginners and professional players as well, nonetheless, it can be suitable for just about anyone at any level. 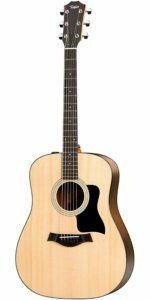 To start off, at the top, the 110e includes a solid Sitka Spruce top, which is standard for tops these days due to its all-around qualities. Considering that it is flexible, this guitar is surprisingly strong and produces a balanced range in terms of both tonality and dynamics. Additionally, the combination of the Sitka Spruce top and Sapele laminate back & sides will deliver you a balance of top end clarity and snap from the Sitka top along with the mid-tone warmth of the mahogany-esque Sapele laminate. Personally, when I first tried it, I found that the tone was well-balanced, while in terms of sustain, it was decently controlled and consistent enough for your ears to have the most enjoyable listening experience. Moving on, at the back and sides, you will notice that they are made from Sapele Laminate, which as we know, it looks elegant and it gives a great look to the overall aesthetics. However, for some users, laminated wood is not their ideal option, but for this price range, it is probably the perfect choice, and it isn’t that bad after all. To be more specific, Sapele Laminate accomplishes to replicate the sound of Mahogany but of course, at a much cheaper price. Although it is not the same case with the neck, considering that it is made from Mahogany, in this particular situation, Mahogany is a great material for necks, so there are no doubts about the lack of quality here or whatsoever. What I also like about this guitar is the bridge wood since it is made from ebony, which is a great choice considering that ebony is a hard and dense material, which as we know, this helps to transfer the energy from vibrations of the strings into the soundboard. To continue, we also noticed that the bridge saddle, pins, and nut were made from TUSQ. For your information, TUSQ is a synthesized material that is made to replicate bone, which makes it a great addition because you can control the consistency in a synthesized material. During our research, we noticed that users were really satisfied and enjoyed the feel of the 110e’s fretboard. The fretboard is made of ebony, which is typically seen on most of the high-end guitars. However, it may not be the same quality since there are different levels of quality, but again, Taylor is using the best ebony they can find. Moreover, if you are worried about changing the strings, well, the 110e comes with a decent set to make the process easier. Now, I couldn’t really make the difference, but I think that the strings I played on were Medium Gauge Strings. 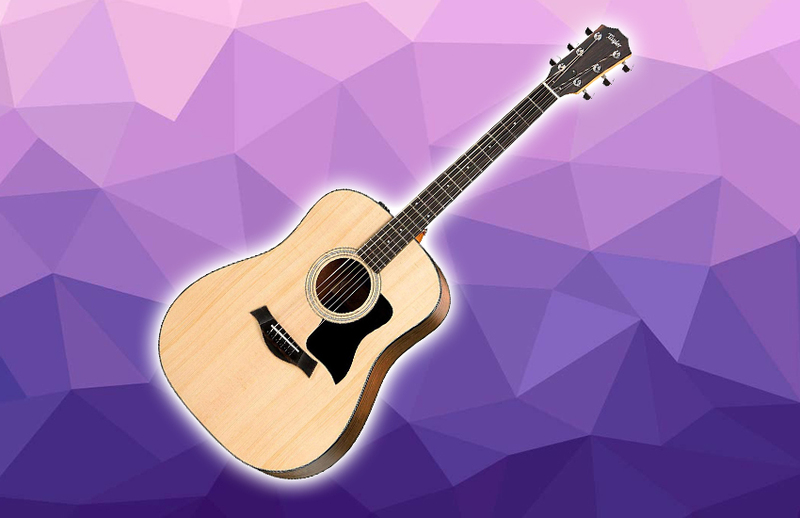 To sum up, the Taylor 110e is one of the few acoustic guitars that offers great value for the price, so, we highly recommend you consider it and assure yourself of its quality.